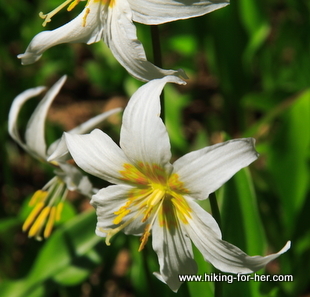 Joyful hiking greetings to you on the Spring Equinox! Because I love the turning of the seasons! What could possibly be more dramatic and thrilling? I hope you realize that you live inside a constantly evolving, ever changing Nature portrait. And lucky you! Your hiking habit takes you right into the middle of all of that glory! If you live in the Northern hemisphere, are you anticipating bright green new leaves, the lengthening days, and the chance to kick up some trail dust on your 2015 spring and summer adventures? If you live in the South, you might be resting on your trail laurels a bit, enjoying newly created hiking memories and planning to create a few more before winter. Either way, the bottom line is how many times this year are you going to pay close attention to the joyful Nature portrait unfolding all around you? This month’s newsletter gives you plenty of reasons to be joyful about hiking: a list of habits which I think perfectly describes hikers, a gift suggestion to bring joy to any outdoorsy female, scientific proof that you’re a mosquito magnet (What’s so joyful about that? Look at it from the perspective of the hungry female mosquito!! ), and an opportunity for a new solo hiking learning experience. in this article has the words “agonizing life trials” in it. If you switch it to “tough hiking trails”, you’ll see why I think these 14 habits can easily be applied to exceptionally happy hikers. For instance, the first habit mentioned is “Appreciate life. Why not switch “life” to “hiking”? An appreciative hiker naturally falls into the other habits: you select trail buddies wisely, you act considerately on the trail, you continuously learn new hiking skills… and on it goes. Please let me know which one really resonated with you! If you live in the United States, or have loved ones who do, here’s a gift suggestion: Adopt An Acre at nature.org. Not sure how much land an acre covers? Turn that into a joyful exploration! Find out how much time it takes for you to cover the distance of one acre on your next hike (you’ll be surprised!). Do Female Mosquitoes Joyfully Target You? Thanks for taking one for the team (i.e. your hiking buddies), you mosquito magnet! Read why you’re so enticing to mosquitoes, and then let me know if you have suggestions for avoiding the bite - or at least making it less itchy once it occurs. Full disclosure: Mosquitoes ignore me for the most part. So I’m really curious about what to advise when I get email about this topic. I teach for a living. So naturally I love to share ("teach") what I know about hiking. And when I get lots of emails asking about the same hiking topic, I perk up and my teacher’s heart beats a little more joyfully. Guess what a teacher does with a bunch of questions? She develops a lesson plan! But in this case, I created a Solo Hiking Curriculum (sounds more impressive, doesn’t it!). It consists of several modules, each with lessons & activities. But here’s my problem: I have no idea if it’s too much information (“TMI”), or not enough. And I don’t know if my suggestions and tips are useful or do-able. What I really need are a few joyful learners (5 at most) to do a trail (oops! I meant trial) run of my Solo Hiking course. If you’re toying with the idea of transitioning into solo hiking, or are serious about conquering your fears around solo hiking, please drop me a line by March 31, 2015 so I can send you more information. Also consider carrying the theme of JOY with you on your next hike. I guarantee that your trail time will be even richer with meaning and purpose. And your "trial" times might go a little easier, too. Send me your questions, thoughts, photos, and plans for an upcoming adventure – I love hearing from you!